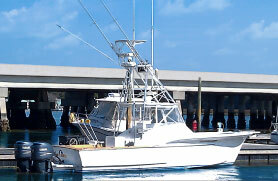 Offshore fishing charters can easily produce the fishing experience of a lifetime. It takes some time to get out to the fishing grounds but once we’re there anglers can look for larger game fish including marlin, sailfish, dolphin and more. Whether you’re a seasoned pro or a first-time fisherman, we have the boat and experienced crew to make your trip unforgettable. Offshore trips are available aboard Full Circle – a 34-foot Custom Carolina Fisharound. Offshore trips are 12 hours. Children are welcome however older children (10 years and older) tend to do better on longer trips. Guests are welcome to bring food and beverage of choice (not provided on the charter). Be sure to wear boat friendly shoes (shoes without black soles). The boat is equipped with Coast Guard regulated safety equipment and a fully stocked medical kit. Offshore trips are considered full-day trips and cost $1,700.